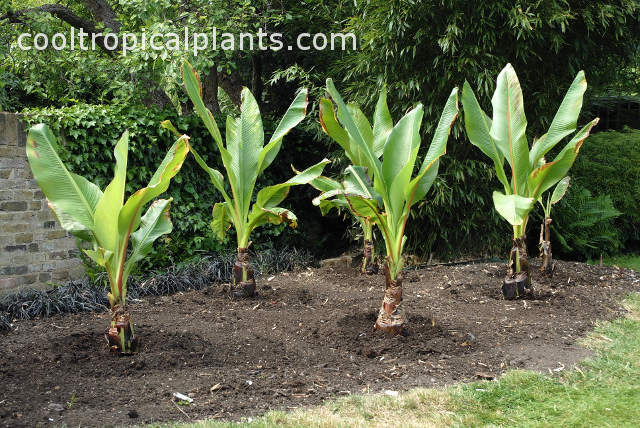 If you don't have the space, a greenhouse or the inclination to grow canna lilies indoors, they can be successfully sown directly into the soil. 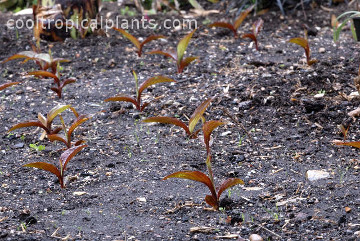 The previous summer this bed had been filled with giant red Ensete ventricosum. They had become too big to dig up and store in the greenhouse so another attempt was made to overwinter them outdoors. Despite the mild winter that followed the plants did not make it. The red Ensetes were replaced with the green ones shown in the picture but there was a lot of exposed soil and nothing on hand to fill it with. 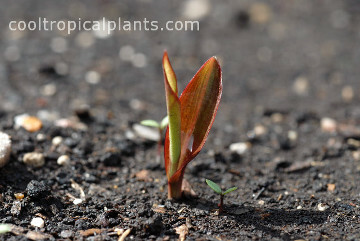 It was decided to see how successful it would be to sow Canna lily seeds directly into the soil. The alternative (shock horror) was to go and spend a fortune on ready made bedding plants. 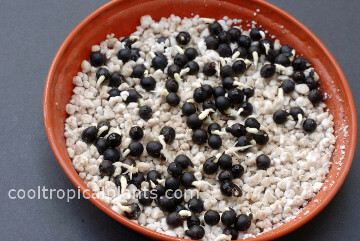 100 Canna warscewiczii seeds were chipped in the usual manner. See here for instructions. 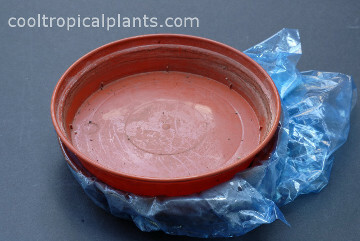 The seeds were then removed and placed in another saucer on a thin layer of damp perlite. This saucer was placed inside a freezer bag to prevent it from drying out. Another saucer was placed on top to prevent them over heating in the sun. Again this was simply left in the greenhouse. 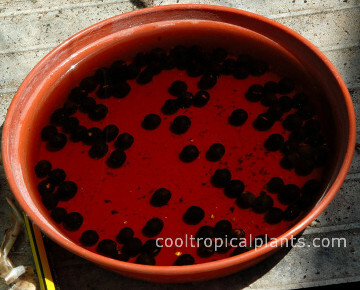 At this point the majority of seeds had germinated and were removed. 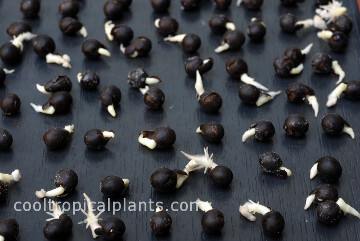 The remainder were replaced into the bag to see if they would germinate later. In the meantime the area to be planted was weeded and raked into a 'fine tilth' to give the newly planted seedling the best possible chance to establish. 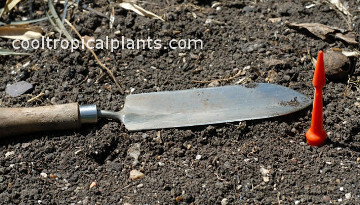 Using the blade of a trowel as a guide, make holes in the soil approximately 8 inches / 20 cms apart in a grid pattern. 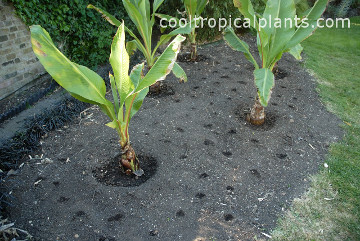 Drop a seed in the hole and cover with soil. The depth of the hole should be about an inch (2.5 cms). It will not harm the Canna lilies if it is a bit deeper it will just take longer for the shoot to appear. 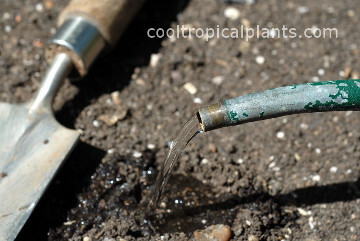 Water in each seed as you go along. This will help to determine if you have missed a bit. 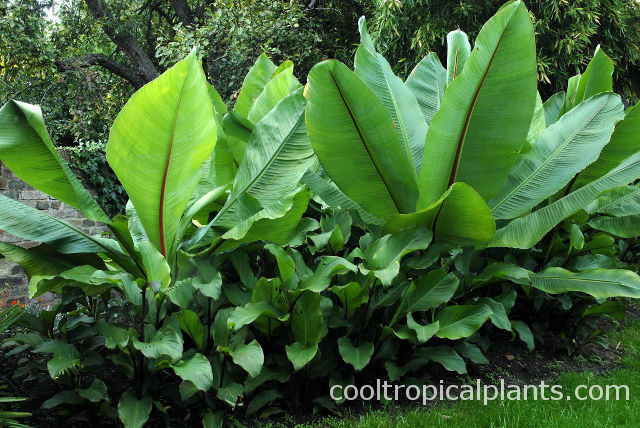 Once you are happy that the Canna lilies are correctly spaced, water the whole area with a gentle spray. Then sit back and wait for the weeds to appear. Approximately 3 weeks after the initial chipping the first shoots were up. The picture to the right was at 5 weeks (from chipping). Weeds will be a nuisance. 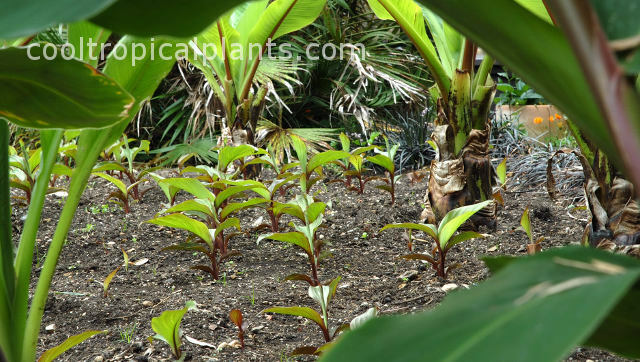 Care needs to be taken when hoeing around your newly emerging Canna seedlings, particularly if there are sensitive people or children present. (Bad language often follows a miss-hoe). 14 weeks later and the Canna lilies have filled out the bed quite nicely. Due to the fact that this procedure was an after thought, the whole chipping process did not start until the very end of May. This resulted in a lack of flowers and the corresponding seed crop for the next year. Ideally the process should be started as soon as any risk of frost is over. 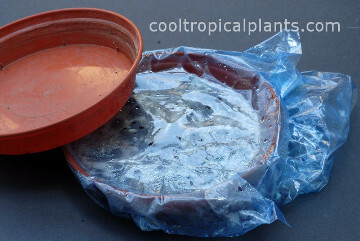 The whole thing can also be speeded along by warming the soil with clear plastic sheeting prior to sowing.